This post first ran in April, 2010. WARNING: If you know what a Catalina deal is and/or have actually employed one, this may not be the post for you. If you occasionally slice your pinky open while using adult scissors, this is definitely the post for you. 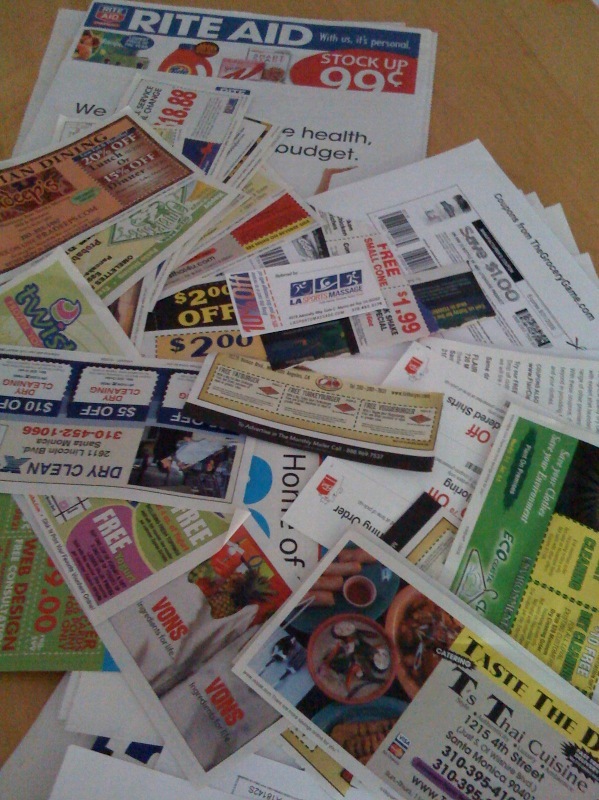 If you’re considering coupons, but don’t know where to start, read on. These simple explanations and stress-free strategies could kick off a lifetime of half-price egg noodles. If you do nothing else, make sure to scroll down to the GOLDEN RULE OF COUPONING, wherein I explain the practice’s most important tenet as well as the origin of the universe. There are a few ways to collect coupons. Some are intuitive, others not so much. Store circulars and magazines. Occasionally, coupons will appear in publications within a supermarket or drugstore, probably by the door or the cashier. Though you’ve already made your plan, leaf through these, since they can offer good last-minute deals or bargains for next time. Store shelves. You know those little ticket dispensers that line supermarket aisles? If they’re located by a food you enjoy, grab one. Hey, you never know. Mailings. If you really like a particular company, you can frequently sign up online to receive coupon packets through the mail. Online. Online coupon deals can be tremendous, but also a giant headache if you spend too much time looking for them. So, be judicious in your search. Speaking of which, there are three basic ways to collect and save. Go to aggregate sites like Coupons.com and Mambo Sprouts (organic). Visit individual company pages like Betty Crocker. Cruise popular forums and consumer sites like A Full Cup and Coupon Mom. Be warned: you might have to sign up for the service and/or install a special printing program, but it can be worth it. Also, not every store accepts print-outs, and many supermarkets often restrict what you can and can’t use. Give your local chain a call before planning any big shopping trip. They’re all small, cute, unobtrusive, and cheap (except the last one). Store ‘em in your desk or among your cookbooks. Forget brand loyalty. You’re looking for products (ex: cheese), not brand names (ex: Sargento). If you find a coupon for a brand you like (Tropicana! ), that’s fantastic, but the better toothpaste deals come when you let go of your Crest fixation. Clip only for products you need or use. When you don’t eat yogurt, own a dog, or have dentures, getting bargains on Activia, Alpo, and Polident is senseless. A good rule of thumb: if you have to think about clipping a particular coupon for more than a few seconds, skip it. Avoid clipping if you can find a comparable generic product. Even with coupons, store brand foods are almost always cheaper. In most cases, people can’t tell the difference in flavor or texture, either. Be on the lookout for pantry staples. Yay! These diamonds in the aspartame-blanketed rough are more common than you might believe. Currently (4/14/10), in my alarm clock stack, I have coupons for bread, olive oil, sour cream, butter, soy milk, mustard, dried beans, chocolate chips, cooking spray, corn starch, baking powder, rice, pasta, and egg noodles. Not to mention tin foil, gum, deodorant, and the all-important Zyrtec (a brand we will not forgo). Be on special lookout for personal products. Coupons are fantastic for cosmetics and body care items (shampoo, toothpaste, etc.). If you like L’Oreal eyeliner, and see a bargain, don’t hesitate. You could consistently save 50% or more without much effort. Take advantage of double and triple coupon days. Never in my life have I seen a Double Coupon Day in a New York City supermarket. But I’m assured they exist in many other wonderful parts of the country, as does the rare and hallowed Triple Coupon Day. Check your grocer’s website for dates. Beware hoarding. Odds are you’ll never end up in a terrifying A&E series, but there is such a thing as going overboard on coupons. If you don’t have sufficient storage OR the product will go bad before you use it, avoid buying multiples. Wait for sales to use your coupons. Sales alone can save you money. Coupons alone can save you money. But they’re at their most powerful when combined. This may mean waiting a few weeks after your initial clippage, but trust me, it’s worth it. Let me give you an example: I buy Del Monte diced canned tomatoes all the time. They’re usually $1.89 at my local supermarket. (Not a typo. I double checked.) Two weeks ago, they went on sale for $1.00 each. That’s a good deal by itself. However, I also had a coupon for $1.00 off four cans, meaning each dropped to $0.75. What would have been a $7.56 spending spree became a $3.00 bargain. I saved 60% off the usual price. In order to obtain these most excellent deals, leaf through your supermarket circular (at its own website or Money Saving Mom) before going shopping. Food companies generally offer circular and coupon deals around the same time, so matching them will be easier than you think. Angus Anguish: Is Angus Beef Worth the Money? Ask the Internet: Dealing With Food Allergies?